This mobile infrared diesel fired heater does not create any dust particles in the air as there is no air movement. It is quick & easy to install has a fuel consumption of 3.56L per hour. 230V, 100% thermal efficiency & has a 38Kw thermal power. These propane gas heaters have a heat output of 48-81.7 Kw (variable) and cover a heating area of 1960m3. The stand at the bottom of the heater allows you 3 settings to alter the direction of the heat flow up and down. Master gas heaters provide large amount of instant heat. They are incredibly cost effective, robust and very efficient. 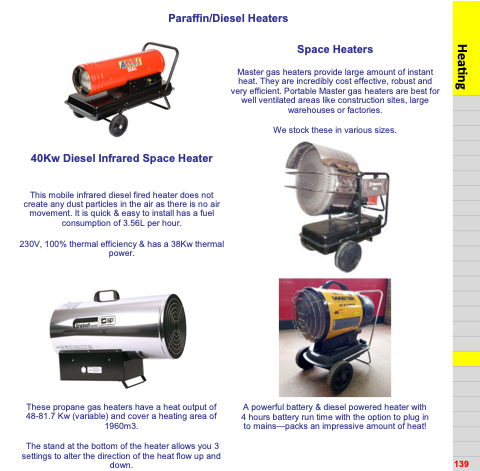 Portable Master gas heaters are best for well ventilated areas like construction sites, large warehouses or factories. We stock these in various sizes. A powerful battery & die.sel powered heater with 4 hours battery run time with the option to plug in to mains—packs an impressive amount of heat!